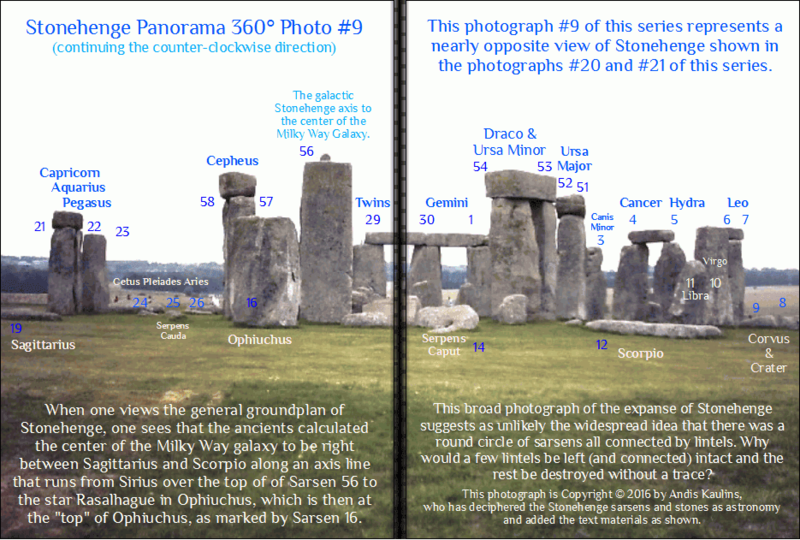 Our panorama tour of Stonehenge proceeds counter-clockwise! On that tour we will identify the stars represented by the sarsens and stones of Stonehenge. Interesting proofs will then follow through the analysis of individual stones. Our panorama tour of Stonehenge proceeds counter-clockwise! 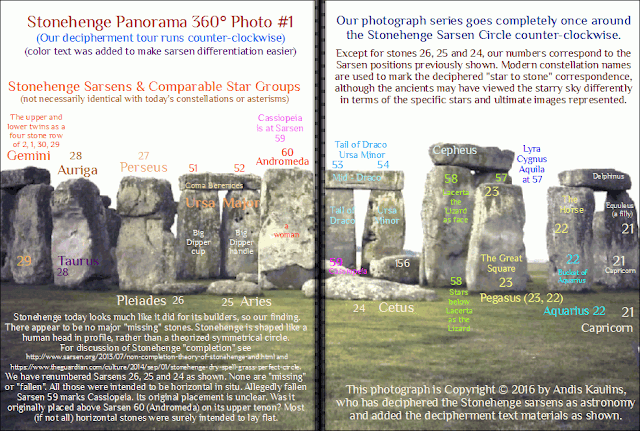 We identify the stars represented by the sarsens and stones of Stonehenge. Interesting proofs follow subsequently through the analysis of individual stones. This photograph and the accompanying text explanations are all Copyright © 2016 by Andis Kaulins. Enjoy! We now know from the previous postings that the above circular view is likely not entirely correct, even though we always focused on what turns out to be the Main Axis. Moreover, we now know that the Main Axis is more to the right than what our photograph took to be the main axis line eleven years ago. Photographs and proofs of various kinds follow. Enjoy! As previously noted, see Stonehenge Deciphered by Andis Kaulins, the inner henge of Stonehenge sarsens so familiar to all as the most famous megalithic site in the world, will be proven by subsequent photographs and analysis of those photographs as being astronomical in nature and marking stars in the sky in the hermetic tradition, "as above, so below". It's the stars, folks. 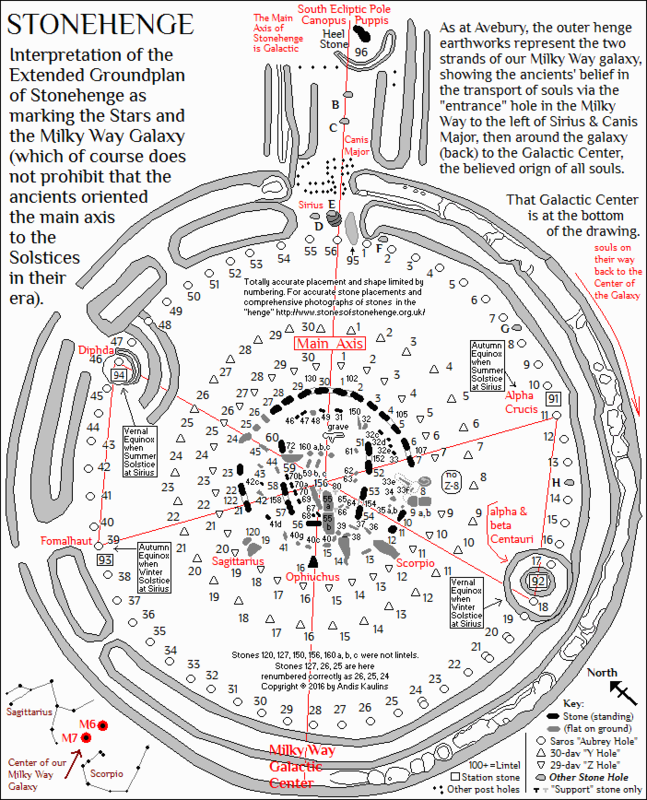 A larger map of the extended Stonehenge groundplan as previously posted in Stonehenge Extended Groundplan Map, is here interpreted "galactically" -- we use that term respectfully for all the "Trekkies" out there -- because the ancients, as analyzed below, set up the Stonehenge site with the main axis running from the South Elciptic Pole, Canopus, Puppis (Apophis), Canis Major, and Sirius, through and between the upper and lower twins of Gemini, and running through the stars to the "galactic center" of the Milky Way Galaxy, which is located near the famed M6 and M7 (Messier objects) between the well-known stars of Sagittarius and Scorpio. 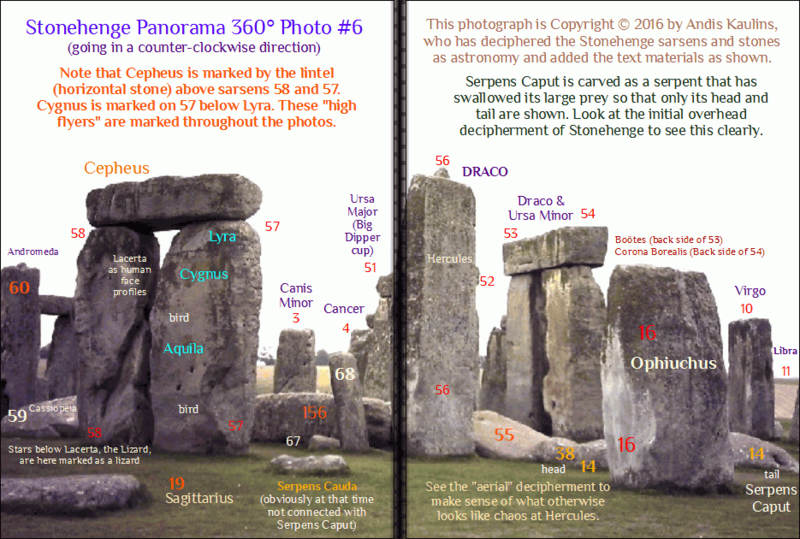 We made that discovery of the main axis based on our decipherment of the stones of Avebury, as already presented online in detail for Stone #10, the stone that gives us the "keys to the kingdom" for the stones of the ancient British Isles. Indeed, the arrow of the archer Sagittarius would seem to have intentionally been designed by the ancients to aim directly at that galactic center. We can say that mainstream researchers have very much underestimated the observational talents and astronomical capabilities of the ancients. Moreover, M6, well-known as the "Butterly Cluster" because of its butterfly shape, and M7, known as "Ptolemy's Cluster" or simply the "Ptolemy Cluster", which has a more rectangular shape, can both be seen with the naked eye (more easily with binoculars), and BOTH were already surely known in antiquity. M7 was recorded in 130 A.D. in the Almagest as Object 567 by the great Greek-Roman-Egyptian astronomer Claudius Ptolemy who described it as as a "nebula" near the "sting" stars of Scorpio. Since both M6 and M7 are clusters visible to the naked eye, one could logically ask whether other ancient stargazers prior to Ptolemy saw and/or recorded either M6 and/or M7. 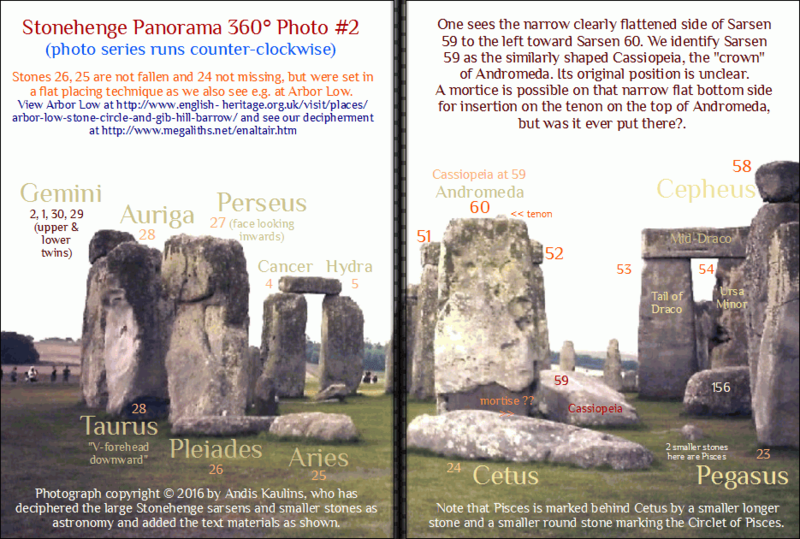 We suggest in one of the next postings that the "Butterfly Cluster" was in fact recorded on a stone at Stonehenge. One amazing thing about our presented galactic interpretation above is that it suggests that Stonehenge was built as a "model" of the then "known universe" and not just as a simple astronomical "observatory" that recorded or calculated solar and/or lunar alignments. 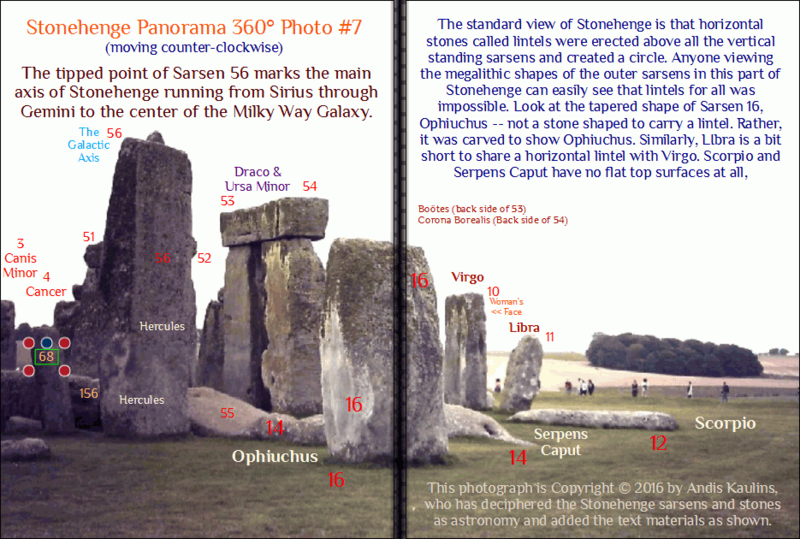 The key to the ancients' galacitc understanding is by our analysis present in the so-called mysterious "station stones" 91, 92, 93 and 94, of which 92 and 94 are allegedly "missing". 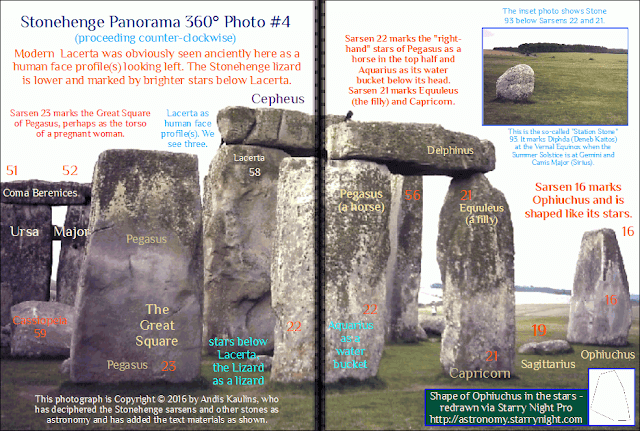 See The Stones of Stonehenge Station Stone. Both "missing stone" positions, however, are marked by large mounds (barrows) so that perhaps no stones 92 or 94 ever existed. The mound at which 92 was allegedly placed is flanked on the mound by two Aubrey stones. 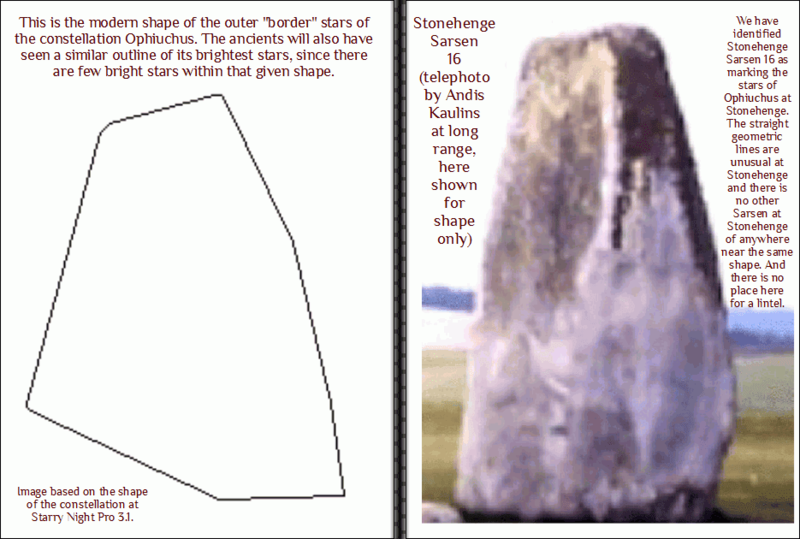 If the Aubrey stones marked perimeter stars for some kind for an astronomical or calendric counting system like Saros, could those Aubrey stones then mark two separate but closely seen stars, rather than one? and if so, which stars? 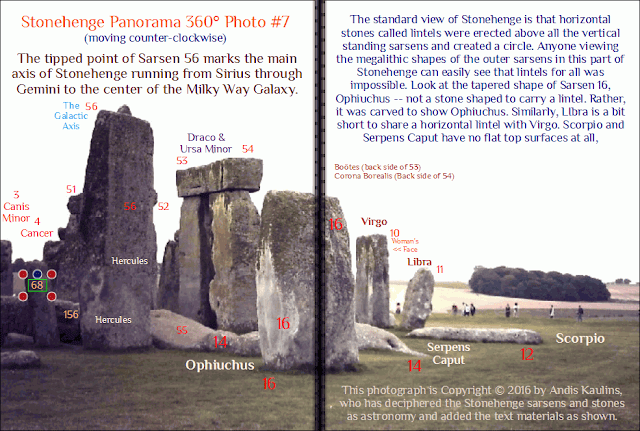 After many months of fruitless effort to fit the station stones into our Stonehenge decipherment, it occurred to us that the station stones and mounds could mark stars that were important for the ancients' overall "galactic" astronomy rather than being tied to an astronomical parameter that existed during the Stonhenge construction era. Our own photo of Station Stone 91, made in the year 2005, convinced us that it marked human heads being submerged viz. swallowed due to precession and that Station Stone 91 likely marked one or more stars of Crux, the Southern Cross, perhaps Alpha Crucis, its brightest star. and the Vernal Equinox is at ca. the stars alpha and beta Centauri. 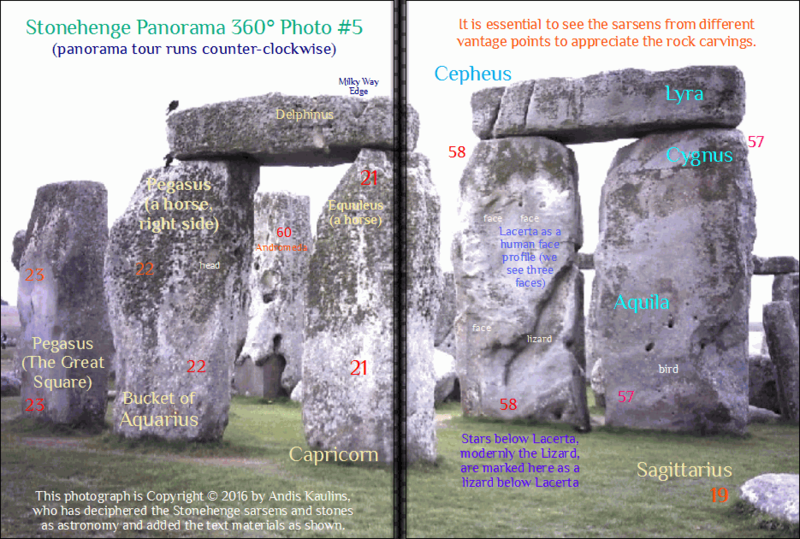 That lack of symmetry is caused by precession and it is the above combination of stars that appears to fit the Station Stones, as in our image above and as we show demonstrably with our scans of two settings of the Learning Technologies Milton D. Heifetz Historical Planisphere Precession of the Equinoxes in the next posting (we split the postings in order not to overburden pcs or servers with too many images in one posting). Note that the position of the Station Stones we describe above CAN NOT be done with a "fixed" position of your sky map or astronomy software. We spent months dealing with that problem.... It only works if you use the applicable different dates viz. eras for each case! The so-called "station stones" on the extended outer henge are thus quite unusual and show that the ancients understood the ca. 26000-year cycle of precession and its assymetrical effect on the locations of the Autumn and Vernal Equinoxes in the stars (i.e. the stars visible behind the Equinoxes at the time of the Equinox occurrence). 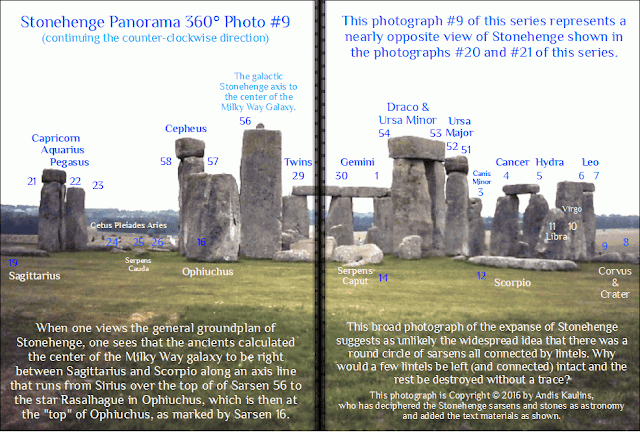 The above analysis of the galactic Equinox positions helps to explain a perplexing problem that our Stonehenge decipherment raised regarding the Main Axis and the Summer Solstice at Stonehenge. 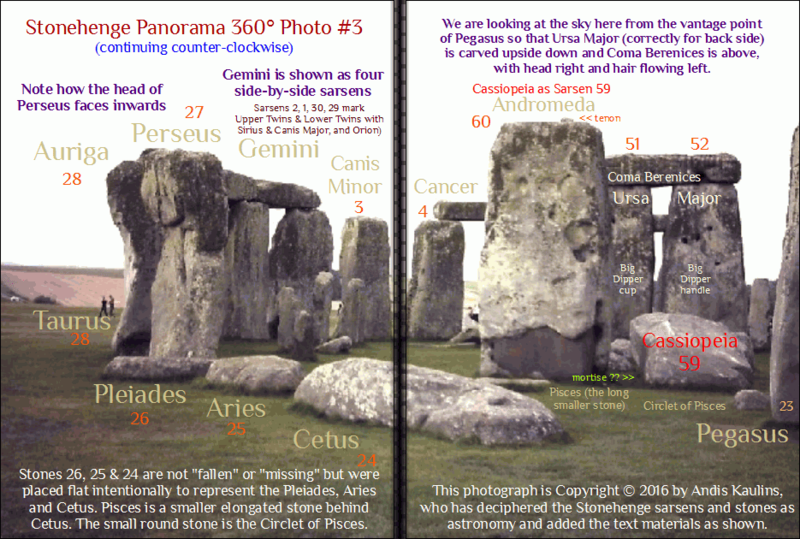 We are certain that the Main Axis is correct and that our identification of the stars represented by the Stonhenge sarsens and stones is also correct, so why, we asked, would the ancients have faced the sarsens marking the stars of Gemini toward the position of the Summer Solstice in their era? The only reason can have been to align everything with the main galactic axis. In ca. 1800 B.C. 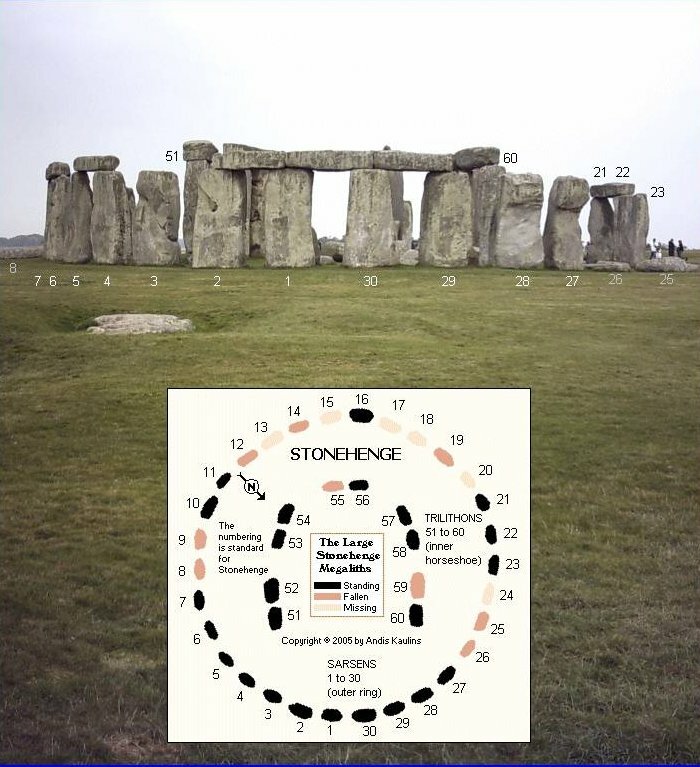 -- the general mainstream accepted date for the construction of the Stonehenge that we currently are able to view (there may have been predecessors) -- the Summer Solstice as marked by the background of stars in that era took place at the head of Leo and not in Gemini. The Summer Solstice in the stars of Gemini on the line to Sirius occurred much later, i.e. only in ca. 1000 A.D. according to our Starry Night Pro software and even later than that acording to the Heifetz Planisphere. 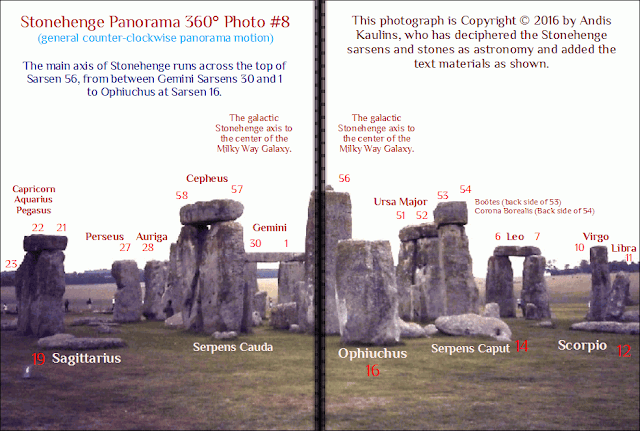 Hence, either the Stonehenge sarsens and stones were all (re)moved to their present positions in ca. 1000 A.D. from their original locations, or the Stonehenge construction was a model of the universe that recorded viz. anticipated a "standard" view of the universe that did not necessarily represent a particular date of construction by astronomy.